Stress fractures to the metatarsals are not an uncommon cause of pain and disability in our patient population. Early recognition of this injury is key in successful patient management. Stress fractures are caused by repetitive mechanical forces applied to a bone that exceeds its ability to maintain structural support in resisting applied load to the bone. 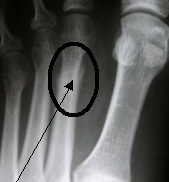 Stress applied to bone repetitively that exceeds its ability to resist injury causes microscopic fracture pattern involving one or both cortices of the metatarsals. Frequency of fracture distribution with most common to least common are 2,3,4,5,1. Each metatarsal maintains a normal 20% of the forefoot load with normal walking activity. Change in load distributions related to faulty foot biomechanics, osteopenic states or overuse conditions such as poor training techniques are key in the development of stress fractures. Clinical presentation is the key to early diagnosis and treatment. Patients may present without historic information supporting an injurious event or even increase in activity. Injury to the metatarsal may be as simple as a day’s walking activity in poorly supportive shoes like loafers. Patients report unilateral swelling to the dorsal forefoot with pain that worsens through the day’s activities. It is important to note that the pain is minimally symptomatic upon initial weight bearing in the morning but is worse as the day progresses. Palpable pain to the metatarsal shaft is always noted with exam. Localized pain to the metatarsal associated with dorsal foot swelling is key for the diagnosis of this injury. The picture below shows the clinical appearance and an early stress fracture to the third metatarsal with noted diffuse forefoot edema. Radiographic examination is a poor early indicator of this stress injury. Plain film radiographs will only begin to locate the stress fracture after at least two weeks for onset of injury with first notable periosteal reaction at the site of fracture as well as early cortical irregularities matching the point of maximal tenderness. Plain film radiographs and their corresponding radiology reports are almost always negative for fracture. The following clinical radiographs represent a progression of early second metatarsal stress fracture in the left photo with progressive bone formation with healing at the fracture site. Bone scan and MRI has high sensitivity and specificity for stress fractures of the metatarsals but is used selectively based on the clinical situation. These studies are often reserved for high level athletes if there is any question with regard to clinical findings. Below is an MRI of a second metatarsal stress fracture showing fluid intensity helping support the diagnosis. Early treatment will help relieve pain and allow healing. Limitation of activity is not enough to decrease load through the metatarsal. Immobilization with post surgical shoe at least can be done but more preferably with the use of a removable cast boot or CAM walker for a three to four week period of time preferable. The goal of treatment is to decrease the torsional load through the metatarsal to allow adequate osteoblastic bone healing response at the site of injury. Delayed or poorly managed stress fractures can cause loss of supportive function of the metatarsal after healing and lead to stress fractures in the adjacent metatarsal bones. Early primary care recognition of these injuries will improve patient quality of care with early return to function and daily activity. 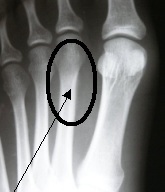 X-Ray of 2nd Metarsal stress fracture and periosteal reaction. 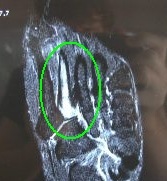 X-Ray of 2nd Metarsal stress fracture depicting progressive healing. Effects of custom and semi-custom foot orthotics on second metatarsal bone strain during dynamic gait simulation.